I added my post with log to help authors and not that of even the slightest criticism. OK, game do not work - what else criticism is needed? You say I am perfect. This is not true. But I don't say things about quality or my quality is best and other things. When someone says about quality, and then releases buggy addon - it looks strange, don't you find. So i download a mod ive been anxiously waiting. After quick install i jump in random scenario and holy snow - i see a lot of small new things that really fits to homm3 - some kind of new carnivore plant reminded me homm4 lvl6 venom spitter, cool looking path(movement crosses that are in 3d), a new town which looks amazing and few unknown buildings. Immediatly i get so involved i open the city and it just looks so beautiful and the music while it does sound like a pirate music it feels like it was made for homm3. This mod is so cool.. The first let down i see is a new "bar" where explanations appear on what what does (when i mouse over okay button it tells me "exit" which is redundant) The second thing probably directly connected to the first issue where i open new city and want to look at creatures and i see NO shooters! So i jump in to my game strategy going for castle and getting 4k a day, and after few more days i get a sorceress. After that i realize this town has 2shooters! And she casts weakness after dealing damage. You just cannot express the excitement. Thats like playing heroes3 for the first time again! Overall this is the post i write during my first impression(10-15min of gameplay) Found some epic dweller buildings where vamps hide and throngs of zombies and dragons. Thank you for the MOD!! It looks like this mod brings more than just a new town to heroes3. Seriously these guys who worked to create a mod should get PAID!! But I don't say things about quality or my quality is best and other things. The difference is that your work is awful and nobody would ever like to use it, whereas HotA (even if buggy) is still considered AWESOME by community, I guess you are just envious. You are wrong. My work is already used. It's just you don't know it. I asked to not mention me in some projects. knowing that there are haters like you that will criticize any thing I've made. I already had my work criticized in part of graphics (lol, it's not my graphics). So I don't give a dawn about comments that my work is awful from people, who didn't seen my works. Wowza! Amazing work, HotA team! I know where my January's going - I'll be playing this non stop! I can't express the extent of my thanks for all your efforts! Seems like team, that are so obsessed about "quality", simply hastened release. I see many reports of crashes and bugs here and there. Seems it was better to do additional testing. First HOTA beta release was not so buggy. Edited by Hippox89 at 22:21, 01 Jan 2014. Well, of course bugs and crashes are to be expected, Macron1. HotA is not 'finished', and we're not just players; we're also testers, right? The HotA crew cannot possibly spend much of their precious time being testers themselves. About the new artifacts, I really like them but wasn't diplomacy already imbalanced? The suit seem to boost your effective army value x 3 ! I understand that any town can get diplomacy, but it's still the most powerful secondary ability by far, already. Otherwise, they're seem really cool and no doubt beautifully made. About objects, a couple structures like the Cover of Darkness still doesn't spawn on random maps, so this seems to indicate that HotA do not want this to happen. However, could such structures not be enable in the RMG and then disabled via the objects.txt, instead? That way you enable it if you wanted. But maybe there more to it than that? Seriously these guys who worked to create a mod should get PAID!! If it only was that simply then I'd donate, too, but legally then I do not know if it's possible. However, it's amazing that these guys do it without any pay, but they do it for other reasons like passion/being a hobby and also for the experience, too. The support for original campaigns is not prioritised for the nearest future - there is still a lot of work to do. Some day later it is quite possible. For voice-over we don't have actors, I suppose. 3. Conflux got Firebird intrest changed to +1, but a new structure appeared, that gives Firebirds +1 interest. 4. Magogs got new mechanics for their fireball shot. They can shoot now to any hex of the battlefield (invoked by pressing G or special button in creature mune). Also, the Upg Hell Hole does not require 2nd lvl guild anymore. Only the 1st. 5. Cavaliers are of course upgradeable in stables - this is one of the core features for Castle. Sorry, just don't have time atm to answer everything. Need to go. Thx for your feedback everyone! Edited by Hippox89 at 22:33, 01 Jan 2014. I know this is lame asking, but how soon do you think the hotfix will come? I'm just asking because I'm going to play with a friend tomorrow, but we'll might wait for such a hotfix. Then again, the crashes that I have experienced might be related to the AI which we're not going to use, anyhow. Again, I know it's kinda pointless asking. It's coming when it's done, of course. Edited by Storm-Giant at 22:33, 01 Jan 2014. Nix Warriors surely know how to defend the Gate! Edited by revolut1oN at 22:35, 01 Jan 2014. Edited by fred79 at 22:44, 01 Jan 2014.
this coming from a guy that's never added anything to the game. seriously, though, macron. drop it. hota has done more than enough with their mods, talking **** about anything they do, or how they do it, only makes you look like a moron. instead of always talking **** about other people's work, why not refine your own? it would be much more productive that way. macron, this constant back-and-forth between your criticism of everyone else's work, and that anyone has to respond to it, is pure bull****. Edited by Hobbit at 22:50, 01 Jan 2014. 1. To be particular about quality and release a non-bugged, well done add-on. 2. To not give a damn about quality and still release a non-bugged, well done add-on. 3. To be particular about quality and still release a buggy, poorly done add-on. 4. To not give a damn about quality and release a buggy, poorly done add-on. First two are obvious - everyone is happy when they get something well done. Both are not really probable though, especially the second one. Third one can make some people angry, but hey - these people still care about that and they'll improve their work so that this add-on would be actually playable. And if their work is already great, after fixing several bugs it would be just awesome! But fourth one, which is what YOU represent, is a total failure, and I'm still wondering why some people think that's the best way to make mods. Such projects make players angry, because they were given something unplayable, and yet authors don't care about improving it, so these mods die pretty quickly. Such project as this would be worthless from the very beginning. Maybe HotA Crew did fail a little at some point, but they got up very quickly and they are already solving these problems. And that's awesome. Keep it up, guys! I asked to not mention me in some projects. knowing that there are haters like you that will criticize any thing I've made. You don't have to be a seller to name someone a thief. Edited by Hippox89 at 00:09, 02 Jan 2014. When you're attacking a crept the background is completely black. Seems to happen in multiplayer, but not in singleplayer. I don't truely know the consistency of when these bugs happen (SP, MP, HS), but this is how it seems so far, at least. It might be coincidentally. Also, the scenario map 'Province' has not been translated, at least, not completely. I probably shouldn't post what seem to be HD mod related issues in this thread, though. Let me know if it's okay. Edited by Sav at 23:44, 01 Jan 2014. I know this is lame asking, but how soon do you think the hotfix will come? I hope soon, some crashes and bugs have been already fixed, thanks for the reports. I guess this is a bug. Instead of the being able to see the map in the background, there's just interface graphics. It seems only to happen when playing hotseat, not singleplayer nor multiplayer. 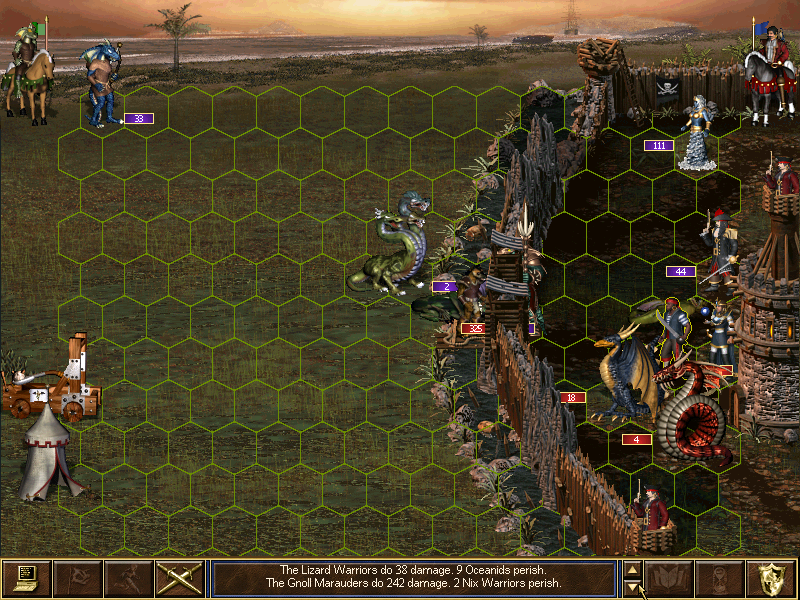 Is`s feature of the last version of HD-mod: when you attack your opponent in hotseat he shouldn`t see your map. I think it`s HD-mod bug, but I'll check it to be sure. Maybe I shouldn't post HD mod related issues in this thread, though. Let me know if it's okay. I think they these happen in H3, too, but not 100% sure. When not 100% sure that bug happens in SoD - better post it here, we will check it. Edited by revolut1oN at 23:48, 01 Jan 2014. OK ty for your answers. I have red the translated change-log, I got an idea that is more than enough for the moment. Regarding crashes... I find it quite playable. Ofcourse issues will be found, but they will get fixed => everybody happy . Here a Log for a crash (me and also a friend) had ~ every 2 hours. From what I can figure is "big" spell book related. (Very, very rarely when I open spellbook in battle, without even clicking on anything, just moving mouse, I get a crash ). Upon reload there everything works just fine. - Movement between land and water still takes 1 full turn! That is too much and will still make users play maps with no water. To fix that, boarding/unboarding should take some fix number of your remaining movement points. (Like Town Portal). This can be affected by skills. Edited by Hippox89 at 00:11, 02 Jan 2014. Hmm, I only experienced rich waters on island maps XL or giant, default template. I've only seen great dispersion of different structures, and I haven't seen anything strange (yet). I the new sea is really great. This is a pretty normal slight for me. that's one i've never heard before. Edited by krs at 00:21, 02 Jan 2014. I find the rmg generated water content like you show above... completely unappealing. Prob for that we need a new rmg. I was talking about user made! maps with water. They look way nicer than before, but still full of great expenses of "empty" water. I would prefer them much denser in content. Maybe like we have roads on land add some "highways" on water (between islands) that have more content concentrated on them.